After announcing to no longer focus on innovations for their email client, Mozilla now released Thunderbird 15. The last major one comes with a new privacy feature that could possibly have a huge impact on the email industry: Do Not Track for email. 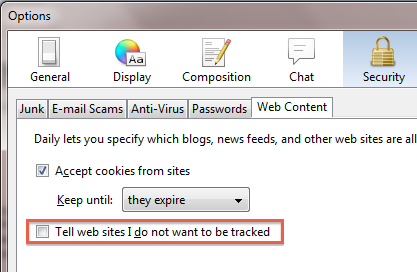 That means, the user shall be empowered to opt-out of tracking his user behavior (opens, clicks, …) by ticking a checkbox ‘Tell web sites I do not want to be tracked’ in the ‘Security > Web Content’ menu. Building Do Not Track into Thunderbird is just the first step. Next we will work with email marketing software providers to honor the DNT request. We’re reaching out to email industry leaders and introducing them to DNT and will keep you updated on what happens. One of the big advantages of email marketing (define) is to allow marketers a personalized communication with their prospects and customers along the customer lifecycle. Individual content drives relevance, but it requires personal data. So email relevance and privacy are within a field of tension. What type of data do we have? There’s data that users gave marketers explicitly, e.g. entering ‘salutation’ when signing up. Then there’s also implicit data, like opens and clicks on certain links. Marketers (should) use these information to segment and build target groups – e.g. to retarget or reactivate non-clickers. The problem is: (re-)targeting requires the click and open data to be directly or indirectly (i.e. pseudonymized via IDs) linked to specific email addresses (= count the click for an email address or for an ID). Of course they would also have a value if they weren’t linked to email addresses but completely anonymized (= just count a click generally). Marketers could still do aggregated success analysis for their campaigns. But the real value of these data comes from their contribution to profiling recipients (“person A often clicks on links from category B, so let’s put B-offers upfront in future mails”). Do Not Track for email could cut off such implicit profiling data. What matters most to me is that until now, email marketing seemed to be quite outside of the line of fire when debating web privacy. The discussion mainly focused around opting out of massive web tracking. With Thunderbird 15, Mozilla may have brought the email topic onto the agenda of data protectionists. I personally doubt it will take off. But…what do you think – will other email clients follow Thunderbird and also implement a Do Not Track option for their users? Will email service providers honor DNT headers? 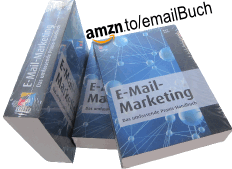 This entry was posted in english and tagged germany, law, legislation, privacy, thunderbird, tracking. Bookmark the permalink.